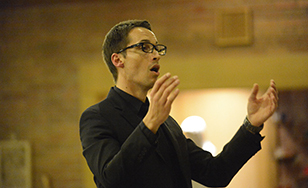 St. Scholastica's 2015-16 music department concert season closes out April 29 with a presentation from three choral ensembles. The St. Scholastica Concert Choir, Bella Voce select women's choir, and Women's Chorus will perform "Let Your Love Be Heard" at 7:30 p.m. Friday, April 29 in the Mitchell Auditorium. Love is a mysterious force that has provoked stories, instigated wars, and most importantly, inspired beautiful choral music. Join these choir groups as they sing to the beauty of love's mystery. Tickets are $5 for general admission. Call (218) 723-7000 for tickets. Information on next year's Spotlight arts, entertainment and lecture series will be posted online at spotlight.css.edu when it becomes available.